SAW011711 SCOTLAND (1947). 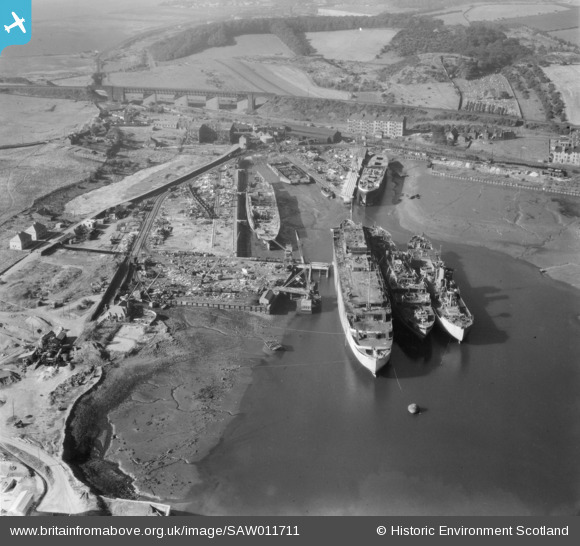 Thomas Ward and Sons Shipbreaking Yard, Inverkeithing. An oblique aerial photograph taken facing west. The vessels include a mine damaged large bulk carrier, a small bulk carrier, two large passenger liners and a general cargo ship. Title [SAW011711] Thomas Ward and Sons Shipbreaking Yard, Inverkeithing. An oblique aerial photograph taken facing west. The vessels include a mine damaged large bulk carrier, a small bulk carrier, two large passenger liners and a general cargo ship.